Recently I came upon a very interesting iPhone application that uses the phone’s built-in sensors to track sleeping patterns. In addition, it also uses the alarm clock function to wake you up at your lightest sleep phase so you can always feel refreshed when waking up in the morning. I was initially really skeptical about this thing that seemed like voodoo magic from the forces of the outer-worlds, but I couldn’t refuse a pleasant sleeping experience–especially at the tiny investment of ninety-nine pennies. On the first night I activated the application and I rolled over in my bed, ready for a pleasant sleeping experience. I soon fell asleep and had a series of dreams that involved empty parking lots, squirrels and ice cream cones, and then I was ushered back into consciousness by a soothing heralding chime that seemed to announce, “a new day awaits you, Geremy-sire!” I woke up with a happy demeanor and a silly grin. This felt like I just visited a spa in my dream. It was only day-one the program was already worth every penny. 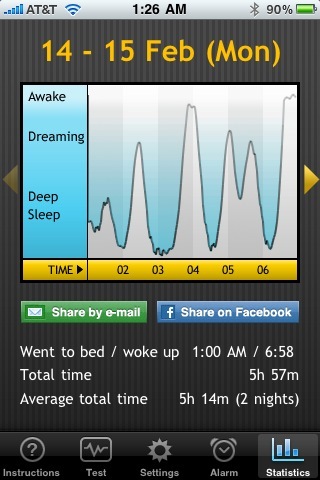 I then took a look at my sleeping graph for the night and was shocked at the results. It appeared that at times I came milliseconds from waking up from my dream, while at other times I might’ve actually woken up and walked around my room for a few minutes. What did I do during those minutes? Did I go to the kitchen to find an actual ice cream cone? Did I go looking for squirrels? Either way, I wouldn’t have known about my sleeping experiences if I didn’t have the app.